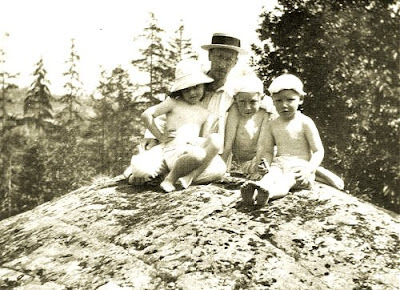 Igor Stravinsky with three of his children Milene, Soulima, and Theodore by his first wife Catherine. (A second daughter Maria was born in 1913). The undated photo was probably taken in Clarens, Switzerland 1913/14. Stravinsky died in New York on April 6, 1971. Soulima plays Stravinsky's Concerto for 2 Solo Pianos with his father in a 1938 recording in the Works of Igor Stravinsky 22 CD box.